At last after an absence of over thirty years, there are Arran bred Black Grouse on the moors of Arran again. Arran was once a stronghold for the Black Grouse, with large numbers regularly recorded all over the Island. Within living memory the Black Grouse was a familiar bird. Historically the Black Grouse received special protection in Arran. In 1703 in the book "A Description of the Western Islands of Scotland" by M. Martin, it is stated that: "The blackcock is not allowed to be killed here without a permit; the transgressors are liable to a fine." In the nineteenth century this was no longer the case with large numbers being shot. In 1956 J.A. Gibson in his publication "The Birds of the Island of Arran" wrote: "Until relatively recently it was a common breeding species and was well distributed throughout the island." Numbers continued to fall, and the last record was a single female in High Glen Cloy on 18 February 2000. This decline was happening in almost all of western and central European countries, with Black Grouse numbers starting to fall in the latter half of the 19th century, accelerating from 1970 to 1990. In the early 1990s it was estimated that about 25,000 males were present in the UK, but in 1995 and 1996 the Royal Society for the Protection of Birds (RSPB), the Game Conservancy Trust (GCT) and Forest Enterprise (FE) conducted a ground survey which established a revised estimate of 6,500 males. The main reasons thought to have contributed to the decline of Black Grouse include: loss of habitat through intensive sheep grazing, agricultural improvements, changes in agricultural practices; overshooting; and increased numbers of predators such as foxes, especially where Black Grouse numbers are already low. Several Black Grouse recovery projects have been initiated in the UK. The Arran Black Grouse Group is one of them. While most of the other projects are focussing on attempts to enhance surviving populations the Arran project is unique in its attempt to re-introduce the birds to a part of their range where they became extinct. Much has changed on the island since the birds died out and the group feels that the island now has the right balance of habitat to give the birds the best chance of survival. The group is very much a local group with a wide range of representation including conservationists, estate managers, farmers, foresters, and gamekeepers. 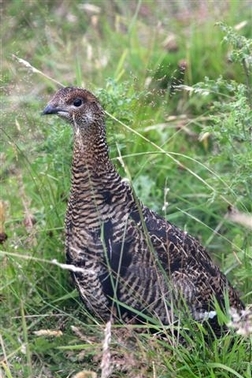 This almost unique partnership of local people including the Arran Natural History Society with the support of Scottish Natural Heritage and the National Trust for Scotland, is committed to Black Grouse reintroduction. In addition through the UK Biodiversity Action Plan and the Scottish Species Action Framework there has been much appreciated advice from Forestry Commission (Scotland). After years of negotiation and planning, in the autumn of 2007 three pairs of Black Grouse were bought to be used as breeding stock. In the first breeding season, problems occurred with egg viability resulting in no Arran chicks for 2008. 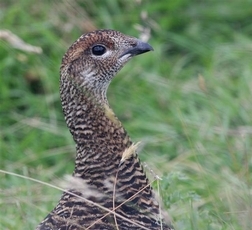 In the autumn of 2008, ten more pairs of grouse were bought to increase the breeding stock. In April 2009, eight 'spare' male black grouse were released into the wild but within three weeks all had died, mainly of starvation. In the 2009 breeding season, problems with the eggs were solved and it was the first successful breeding season. In the autumn of 2009, the Arran Black Grouse Group had an offer of 40 more birds, mainly males, from a breeder who was retiring. Some were kept to replenish breeding stock, but most were released into the wild. Conditioning of the birds prior to release, and supplementary feeding on the hill meant that despite the harshest winter on Arran in many years, 20% were still alive in the spring. 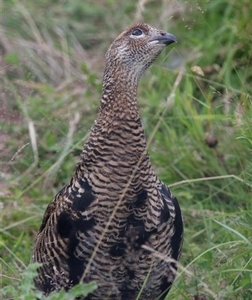 In April 2010, the first wild lek of Black Grouse on Arran was reported in over thirty years. In fact in the spring of this year, the released birds that survived the severe winter, both males and females, were observed at more than one lek site on Arran. In addition, building on the success of the previous breeding season, more than twice the number of chicks were raised by the Arran Black Grouse Group during 2010, and at the end of August 2010 the first Arran bred Black Grouse were released onto the Arran moors. This has been a significant step towards the goal of re-establishing a breeding population of Black Grouse on Arran. As you can tell from the summary above, along the way there have been many trials and tribulations. Breeding Black Grouse has been challenging. A great deal has been learned about the breeding and rearing of these birds. With the help of the University of Glasgow. released birds have been radio tracked in the wild. The Arran Black Grouse Group is determined to build on this experience and achieve the goal of a viable wild breeding population. You can help the Arran Black Grouse financially by making a donation. All funds no matter how small are gratefully received. Cheques made payable to the Arran Black Grouse Group can be sent to Kate Sampson at the Ranger Centre at Brodick Country Park. Donations can also be made on line through this website: http://arranblackgrouse.com/Donations.html .